Herman Voth: churchman and Bible School teacher; born 1 March 1915 in Steinfeld, Molotschna Mennonite Settlement, South Russia to Nikolai Hermann Voth (3 August 1879 – 3 January 1947) and Kaethe (Bartsch) Voth (27 March 1890 – 1916). He was the second child in a family of one son and two daughters. Following the death of Kaethe, Herman’s father Nikolai married Katherina Thiessen in 1917. Eight siblings were added to the family. 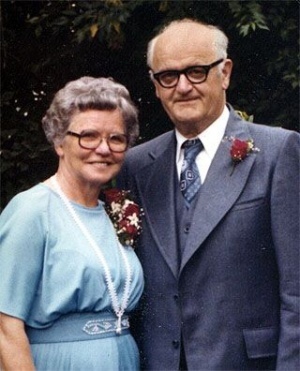 On 6 October 1938, Herman and Katie Janzen (10 June 1917, Ignatyevka, Ignatyevka Mennonite Settlement, South Russia – 14 October 1983, Morden, Manitoba, Canada) were married in Arnaud, Manitoba. Their union was blessed with eight children: Albert, Herbert, Elfrieda, Ruth, Maryanne, Violet, Dorothy, and Donald. Herman died on 6 December 2010 in Morden, Manitoba. On 16 January 1926, Herman moved to Canada with his parents and siblings, settling in Hochfeld, south of Winkler, Manitoba. He came to faith and was baptized in the Winkler Mennonite Brethren (MB) Church on 16 August 1931. In 1940 Herman graduated from a 5-year program at Winkler Bible School. In 1940 Herman and Katie moved to Vineland, Ontario, responding to a call to teach Bible School. He was ordained at the Vineland MB Church in 1943 after serving a two-year apprenticeship (Mitarbeiter) In 1944 he was assigned to teach mainly in the German language at the Virgil MB Bible School (later renamed Eden Bible School). Feeling the need for educational upgrading, Herman moved his family to Abbotsford, British Columbia (BC), which enabled him to study for one year at Tabor College. Herman returned to BC and taught at the East Chilliwack Bible School for one year (1949-50). From 1950 to 1957 he taught at the Mennonite Brethren Bible Institute in Abbotsford while serving as a minister in the South Abbotsford and East Aldergrove MB churches. Voth was East Aldergove’s first paid pastor, where he served from 1954 to 1963. One of his greatest challenges was to lead the congregation in a transition from German to English services. Herman was elected moderator of the BC MB Conference from 1959 to 1960 and assistant moderator in 1962. From 1963 to 1971 Voth pastored the Herbert MB Church. A move back to BC gave Herman the opportunity to lead South Otter MB Church and to work as a chaplain at the Tabor Home in Clearbrook from 1972 to 1976. Herman returned to Manitoba as chaplain of Tabor Home in Morden where he worked from 1976 to 1983. Following retirement, he faithfully served southern Manitoba churches as a guest speaker and as a Bible teacher and volunteer at the Tabor Home in Morden for 20 years. Herman Voth is remembered by many for his witty, personable, outgoing manner. He loved people and served them unselfishly as a teacher, encourager, friend and advocate for over 60 years. His wife Katie died in 1983 after 45 years of marriage. She was a faithful prayer warrior and a constant support to Herman’s ministry. She led many women in prayer ministry and loving counsel. Voth, Albert. "Voth, Herman (1915-2010)." Global Anabaptist Mennonite Encyclopedia Online. February 2011. Web. 18 Apr 2019. http://gameo.org/index.php?title=Voth,_Herman_(1915-2010)&oldid=134016. Voth, Albert. (February 2011). Voth, Herman (1915-2010). Global Anabaptist Mennonite Encyclopedia Online. Retrieved 18 April 2019, from http://gameo.org/index.php?title=Voth,_Herman_(1915-2010)&oldid=134016. This page was last modified on 26 April 2016, at 15:50.